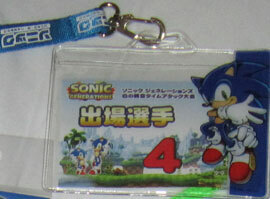 While page 2 had mostly old keychains, page 3 here has a mixture of both. 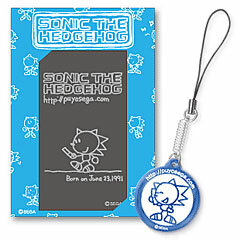 Keychains, key tags and charms / phone charms will all appear on this page. 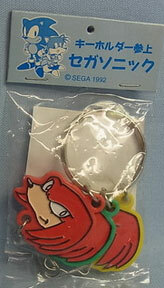 Keychains remain mostly easy to collect, even some of the older ones, if you can find them. Ebay is the best place to look for older ones, but do check the side-bar sometimes for some of the newer ones can appear in stores online. 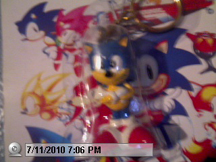 These items were released for Sonic's birthday in 2009. 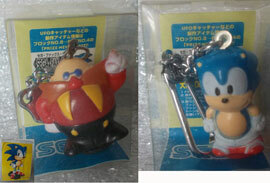 They were featured on the Sonic Team site and were prizes in a competition in Japan only. The boxed gray item may be a cellphone case/pouch or possibly a booklet or wallet. Do you know what it is for sure? If so, write in! To find anything still 'moc' Mint on Card, is unusual. 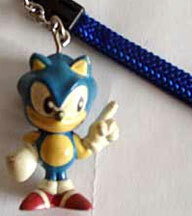 This figural Sonic keychain is likely just a PVC with a loop and chain at the top. He's fully 3D, and packed on a simple bubble card. The card itself is loaded with any stock art they could find, and also gives away an approximate time of release (Sonic CD era), and is copyright 1994. This isn't very big, but it's cool to see how it was originally packaged. Photographed & owned by John. This mini keychain is also a tiny plush! 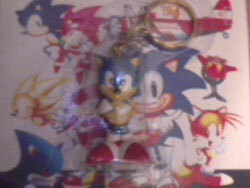 Tiny plushes were released before, but this one is Sonic the Fighters specific, and meant to be used as a keychain. Look at Sonic's odd spikes! They're like 2 flaps on the sides of his head. It looks ok from the front though, with good face detail and classic proportions. Photographed & owned by John. What's up with this keychain, is it real or fake? 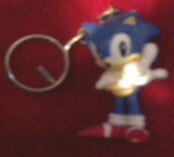 The keychain is a rather bad looking cross-eyed Sonic 3D pvc figure. The face quality seems really bad for Japan, even in the classic/Sonic CD era, which is when the art indicates it's likely from. And what about all the scattered graphics? With no logos, it seems confusing. Write in if you can prove that this is real or fake. for long enough. There is a Japan stock art of the pose, but it's not used frequently. The keychain is cut into the shape of the pose, with goldtone metal. Notice that the lead/chain part is missing here. Here is a full set of Segaprize keychains. These are rather large (for a keychain) and made of die pressed/cut flexible rubber. 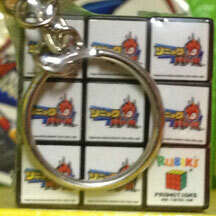 It's the same stuff the older USA keychains were made of, which holds detail quite well, and is layered. 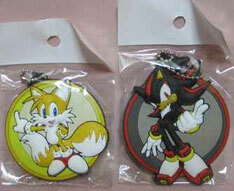 You can get Knuckles, Tails, Sonic, Silver, Shadow or Amy Rose. They were produced for the 20th Anniversary (as seen with the logo on everyone's card) You can sort of see their lead-loop at the top of the card. 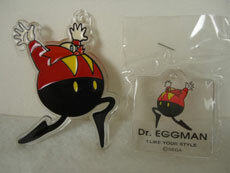 These feature new poses that weren't issued on previous rubber keychains. A nice set! Sometimes find-able on ebay. Were these a UFO prize? over raised-detail metal design, & the right is a brushed metal relief-like shape. The brushed metal shows the detail well and looks pretty classy. These keychains have a fun idea: pixel styling. Each one has tiny lines dividing the art up into squares so they really look like old-style sprites from the games. 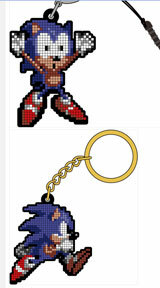 Of course, it's classic style Sonic, but why they chose "Sonic dies" as one of their sprites is unclear. (Isn't that something you'd want if you DIDNT like Sonic?) Also, they felt the need to draw in the keychain loop there for some reason. Each design will be sold as a keychain OR a phone charm with that cord loop. 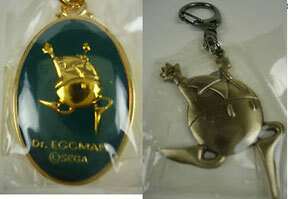 Both will be 630 yen, & available at Tokyo Game Show 2013. Produced by Cospa. Photo discovered by Taaron.